NeedleArts – It’s a Gorgeous One! Are you familiar with the Embroiderers’ Guild of America? If you’re not, and you’ve embroiled yourself in what you believe will be a life-long love affair with hand embroidery, you should get acquainted with the EGA. It’s an organization that spans the continent of the US, and if you live near a major city (and even some minor-major cities), chances are, there’s a chapter close by. Even if there’s not a chapter close by, you can always be what I am, a Member at Large – I’m not attached to nor do I participate in any particular chapter, but as a Member at Large, I can enjoy the benefits of being a member of the EGA. One benefit is receiving the magazine NeedleArts. True, it’s not the greatest benefit, but I like this magazine more and more. And the current issue is a whopper! When the current issue arrived in the mail, it grabbed me! And I know it grabbed more than just me, because I received at least ten emails from readers who asked, “Hey, did you get the new issue of NeedleArts?” And, for some reason or another, they wanted to discuss NeedleArts – the content or the cover. Now, that never happens, but it did with this issue, and I can’t help thinking that it has to do with the cover of the magazine – a cover that’s vivid and lively, with a clear and comprehendible image that’s easy to relate to. The cover features the felt and needlework art of Salley Mavor, author of Felt Wee Folk (a project book I’ve reviewed) and this enchantingly illustrated children’s book, A Pocketful of Posies (also reviewed). With just a simple glance of the cover, I knew what I was looking at – I didn’t have to guess. The cover made me want to open the magazine. And I love it when that happens! This issue continued to delight. Salley’s work is featured in photos along side a very pleasant, readable article. But then – oh joy! oh bliss! 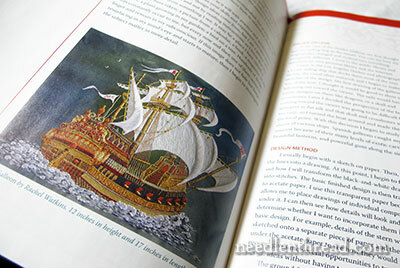 – I came to the article titled Golden Galleon by Rachel Watkins. And it’s about this lovely piece of goldwork and surface embroidery. It is Amazing. I have always wanted to embroider a tall ship under full sail – it’s been on my List since I ever had a list. And this galleon – oh my goodness. It’s exquisite. The detail pictures mesmerized me more than a new I Spy book mesmerizes a kid. And I will spend a lot more time than I already have poring over this article and the pictures accompanying it. 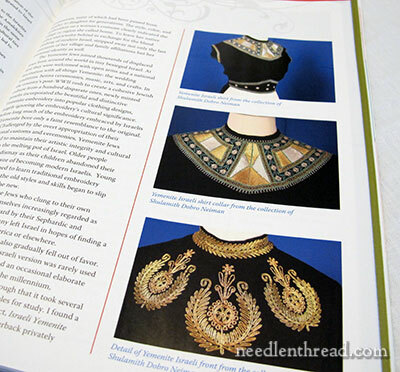 The article is excellent, the pictures are fantastic, the embroidery is… breathtaking. There are other excellent articles in this issue, including “Desert Jewels,” which focuses on Yemenite Israeli Embroidery; an article on Alison Cole, who will be teaching at the National Seminar in Phoenix in October; and several other articles, projects, and announcements of interest. 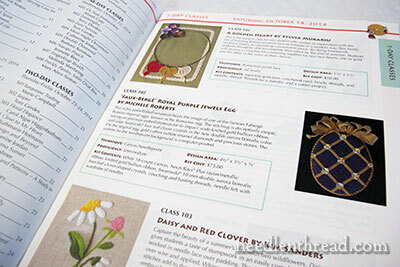 And speaking of the National Seminar, this issue of NeedleArts also includes all the information on this year’s national seminar, which brings me to one of the most notable benefits of being a member of the EGA: ability to attend the local, regional, and national embroidery workshops and seminars. There’s always something going on somewhere around the country with the EGA. Every year, the national seminar is hosted by one of the regions. But each region usually also hosts its own regional seminar every year or so, too. The regional seminars are a smaller affair compared to the national seminar, but they feature well-known instructors, and are usually more affordable than the national seminar. This year’s National Seminar takes place in Phoenix, Arizona, October 18-24, and you can read all about it on the EGA website. I’ve been told the Absolute Greatest benefit of being a member of the EGA is the friendships formed through the guild meetings and various workshops and seminars. Being a member at large and a little too far away to participate in an EGA chapter, I can’t really speak for this part, but I bet there are many members out there who can. If you want to branch out a bit and learn new skills and meet new people with the same needlework interests, find out if there’s an EGA chapter close by! If not, become a member at large, and take advantage of occasional workshops and so forth – they’re fun! You can also take advantage of correspondence courses through the EGA. In short, there are many advantages to membership in the Embroiderers’ Guild of America – it’s worth looking into, to see if it’s right for you! 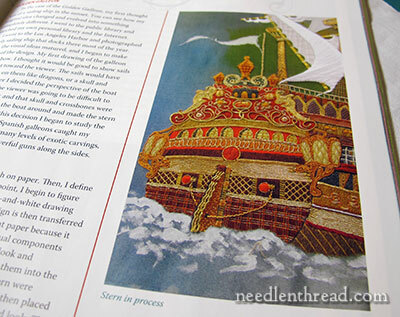 The Needleart magazine looks really interesting and the ship looks gorgeous all that gold work, red thread and white sails wonderful. It’s good to meet people with the same interests where you can work and discuss your favourite hobbies. The courses in October look really interesting and I’m sure it will be great. Thanks for introducing us to the magazine and it’s contents. I was also excited to see this issue. I have loved that piece by Sally Mavor since I first saw a picture of it a couple of years ago. It was great to see the close ups of the birds–I had thought they were done with needlelace. Loved the article about Alison Cole as well. I got to meet her in Australia a few years ago–lovely woman, and I LOVE her designs. I think I have about 10 of them in my stash. All in all, one of the best issues in recent years. (Austin – ASG), I can attest to the friendships that I’ve made with other stitchers. Many of them have become my best friends. This issue of NeedleArts is outstanding, not only for the articles you mentioned but the new sampler project by Eileen Bennett. As a member of ASG’s sampler satellite, this thrilled me. Our sampler group has adopted this as our 2014 project. 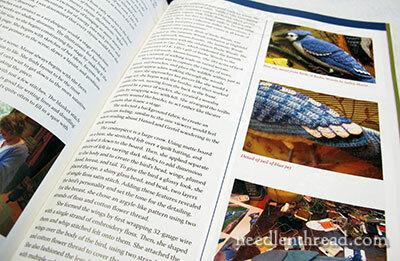 One other thing: Cheryl Christian, the editor of NeedleArts, is a member of our sampler group. I’m always pleased to hear praise for the magazine for this reason, since I think she does a great job! 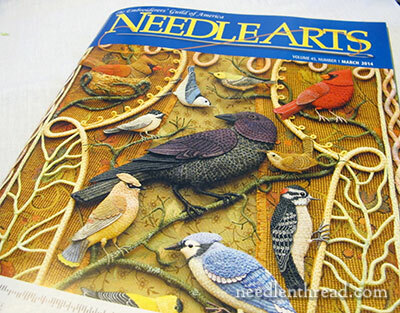 Thank you very much for your kind words about the March 2014 issue of Needle Arts. I so appreciate your thoughtfulness and the work you do. I’ve only been a member of EGA for a few years, but I’ve certainly learned a lot and met a lot of nice people. If you don’t have a regular chapter near you (there’s a list on the EGA web site) you can also join one of the internet-based chapters. There are two that I’m aware of: CyberStitchers and Rocky Mountain Web Stitchers. I have been a member of our local EGA chapter for almost 5 years now. I have meet so many wonderful new friends, that so so willing to help me learn new types of stitching. I found that the more I attended the meeting – I wanted to be more involved as a member. We are always looking to spread the knowledge we have to others. Cheryl Christian is an EGA treasure as Publisher and Editor of Needlearts. It’s been amazing that at least 2 articles in each of the last several Issues have been about someone or something that I have wanted more info about. I’ve already received the pattern for Allison Cole’s Designer Around the World project. I had bought her books when they were 1st published but never had the courage to stitch one of the designs. I’m going to do this one! This issue is a great one–I’ve noticed they’ve been getting better and better. I love the cover–it’s really attention grabbing. I was a MAL for years until we started a chapter. They helped me experiment with teaching and designing in a rather sheltered environment, which is really nice. I have made some great friends at the meetings. I have found the Great Lakes Regional seminars to be really awesome–great teachers and loads of opportunities to meet some lovely people. I also like the correspondence courses. When I couldn’t find crewel instruction here, I took several courses and learned so much from the instruction and critiques. I have done both group and individual correspondence courses and found both worth while. I do think that what you get out of any group depends on what you put in–the more involved you are with your chapter committees and activities, the more you are rewarded. Mary, I’m a Member at Large, although there is a wonderful local chapter, the BC Stitchers, and I was once a member there. You may wonder why anyone would be a member at large with a good group of people close to home. For me,I stay home as much as possible since my husband is handicapped, AND I also have trouble driving at night now. So I support EGA and enjoy the magazine and just dream about the rest. I enjoyed the friendships when I belonged to the local guild, so I would definitely recommend that to anyone who can attend. And you’re right, the latest EGA magazine is incredible. Dear Mary, or should i call u teacher. u are a great teacher, n your explaining is way too cool to describe in words. i have lot of respect for u. I want to learn brazilian stitches, so far i can only do the bullion sticth. i m from Pakistan so, these videos does not play here. can u do picture step by step tutorial of cast on and off stitch in near future, if it doesnt trouble u; i shall be very grateful. I am a fairly new member of EGA and had not found their magazine that enticing until this one. You certainly covered all the highlites of the current issue. The classes for the national meeting look great, even for the novice stitcher like myself. Might we see you at one of those national offerings at some future date? Thank you, Mary, for such a wonderful post on The Embroiderers’ Guild of America! As an alternative to being a Member-At-Large, folks can also join the Tennessee Valley Region’s online chapter, CyberStitchers and have all the benefits of a regular chapter! We happen to think there are additional benefits, too, like being able to chat with fellow members any time day or night via the Yahoo! Groups, or attending meetings in our pajamas! As a matter of fact, our bi-monthly meeting begins today! To attend as a guest, go here and sign up (the meeting will last through next Tuesday): http://www.cyberstitchers.org/joining/guests We’d *love* to have you! 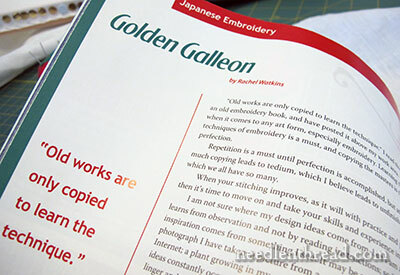 I just wanted to let you know I am a good friend of Rachel Watkins who designed and stitched the Golden Galleon in the EGA Needle Arts magazine. We are in 3 chapters together – 2 EGA and one ANG. We are in metropolitan So. California so have lots of stitching opportunities. Maybe too many. Rachel is a quiet and very humble individual and a true artist. We are lucky to see much of her incredible work. Every time a new piece is shown we are amazed. Thanks for bringing that to our attention. It’s always wonderful to get such fantastic inspiration. What a gorgeous cover! I definitely would buy that magazine (if I could) just for that alone. Really wish we had a similar organization here in Canada. You are absolutely right about EGA: Much to learn, lots to share, opportunities to help, inspiration galore. Above all we find that EGA stitchers are among the most supportive friends one can have. I learned of Needle ‘N’ Thread at my local chapter. Thanks, Mary, for focusing on EGA. Mary, thank you for calling attention to EGA and this month’s Needle Arts issue with my “Birds of Beebe Woods” on the cover. I just returned from a trip and am overwhelmed by the response to the article! For those who want to see the original piece, it is currently on display until March 28th at Artworks Gallery in New Bedford, MA and will be in an exhibit of my work at the Falmouth Historical Society in Falmouth, MA this summer. For anyone who is interested, there will be another article on Yemenite Jewish Embroidery in an upcoming Needle Arts. This one focuses on metal work in the collection of Ziva Naumann. Thank you for the compliments on the last YJE article; I am particularly pleased that you like the photos.